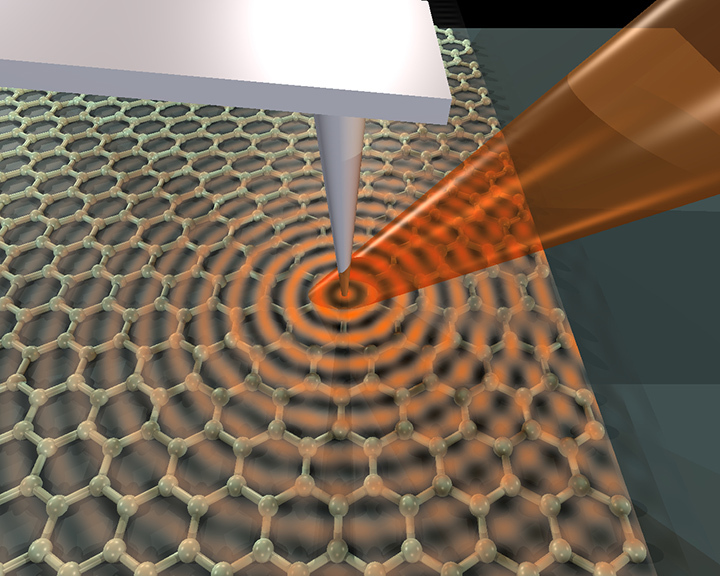 An infrared laser beam focused on the arm of an atomic-force microscope launches plasmons, waves through electrons, on the surface of graphene, a single honeycomb layer of linked carbon atoms. Credit: Basov Lab. “Everybody suspected that plasmons should be there, but seeing is believing. We’ve imaged them and shown that they propagate. And we’ve demonstrated that we can control them,” said Dimitri Basov, professor of physics at the University of California, San Diego, and senior author of the report published online June 21 in advance of print publication in Nature. The Air Force Office of Scientific Research, Office of Naval Research, NASA, DARPA, University of California Office of the President and the National Science Foundation supported this work. Additional authors on the paper include: A.S. Rodin, G.O. Andreev, A.S. McLeod, M. Wagner, M. Thiemens and M.M. Fogler, of UC San Diego; W. Bao, Zeng Zhao and C. N. Lau of UC Riverside; L. M. Zhang of Boston University; G. Dominguez of California State University, San Marcos; A. H. Castro-Neto of the National Research University of Singapore; and F. Keilmann of the Max Planck Institute of Quantum Optics and Center for Nanoscience in Garching, Germany.